In 2011, NASA announced approved funding for a probe to a near Earth asteroid to retrieve a sample, as part of its New Frontiers program. The probe will launch in 2016, arrive in 2019, study the asteroid for a year, then return a sample of hopefully between 50 grams and 2 kilograms to Earth in 2023, which will fall into the Utah desert by a detached return capsule. 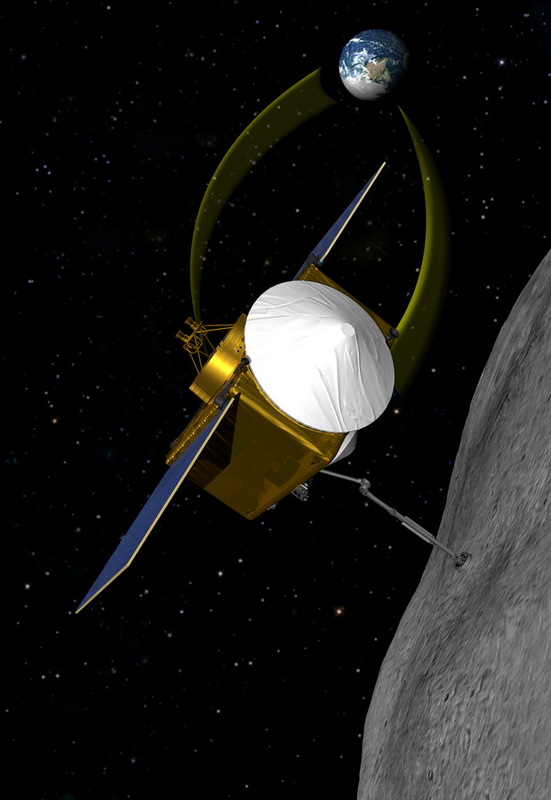 It is hoped the probe will still have enough fuel to go on to another asteroid. The probe is called OSIRIS-REx, an acronym for Origins Spectral-Interpretation Resource-Identification Security Regolith Explorer. The chosen asteroid, 1999 RQ36, is believed to be a very old one rich in organic materials, from nearly the beginning of the solar system. It is approximately 575 meters wide, and is an Apollo asteroid which crosses Earth's orbit. This asteroid will pass close to Earth in 2182, with current calculations putting the chance of a collision as about 1 in 1000, the impact creating a crater about 10 km across and the blast bigger than our biggest nuclear weapon, but it would not be a global catastrophic event if it hit land. This is not a dinosaur extinction sized asteroid, plus it appears to be a very loose and soft asteroid which would probably break up a lot on the way thru the atmosphere. Of course, by 2182, either humans will be long extinct or else we will have the technology and resources to easily deflect the asteroid if we so choose. The OSIRIS-REx probe will also attempt to measure something called the Yarkovsky effect, or the YORP (Yarkovsky-O'Keefe-Radzievskii-Paddack), which is how sunlight and heating changes an asteroid's trajectory, however slight, as well as its spin. There are several ramifications of this in theory, but what gets the most attention is concerns whereby the Yarkovsky effect could possibly change asteroids' orbits enough that our calculations of where they will be in the future could be slightly off, possibly enough to make particular asteroids into more of a threat to Earth. The probe and the project over the years will cost the US government a total of approximately a billion dollars. The project is being developed by the University of Arizona's Lunar and Planetary Laboratory and Lockheed Martin Space Systems, together with the NASA Goddard Space Flight Center.